ANKARA, Jun 8 2013 (IPS) - Now approaching its third week, the “Occupy Taksim” movement, a peaceful sit-in to save Istanbul’s Gezi Park from redevelopment, has taken on a festival-like atmosphere, with protesters organising to stand guard around the clock, provide uninterrupted food and water supplies, and carry out a self-initiated cleaning of the grounds. As the demonstrators grow more settled, however, the government has not changed its position towards them. Upon his return from the Maghreb at 1:40 am Friday, Turkish Prime Minister Recep Tayyip Erdogan reiterated his initial decision to demolish Gezi Park. He did not cede to public requests that he apologise for police violence used to disperse protesters and show greater respect for individual fundamental rights and freedom of expression. “The police are doing their duty. These protests, which have turned into vandalism and utter lawlessness, must end immediately,” Erdoğan declared. Addressing thousands gathered at Istanbul’s Ataturk airport in the early hours of Friday, he blamed terrorists, Marxists, the opposition and foreign conspirators for the unrest and its immediate economic consequences. Later in the morning, Turkish President Abdullah Gul sent a different message while speaking to a group of visiting foreign students on the importance of the respect of “otherness”. “Efforts to oppress one another become the source of many sufferings and conflicts,” Gul said. On Thursday evening, Fetullah Gulen, a popular Turkish Islamic scholar, made a much-awaited speech on the Taksim crisis from Pennsylvania, where he has confined himself for over a decade. Gulen urged authorities not to underestimate and overlook protests, saying, “We share blame” for the unrest. He frequently used “we” to refer to members of his movement in particular and repeatedly blamed his movement for doing too little to eliminate problems Turkish society faces, particularly on an ethical level. Gulen supported Erdogan’s Justice and Development Party (AKP) at its inception but began to distance himself from it in 2010. Gulen’s speech fell short of admonishing the government for its handling of the crisis and seemed to support Erdogan’s stance – that elections are the only way to change the situation. Many of Gulen’s followers, who include journalists and academics, had expected a clearer position on fundamental rights. 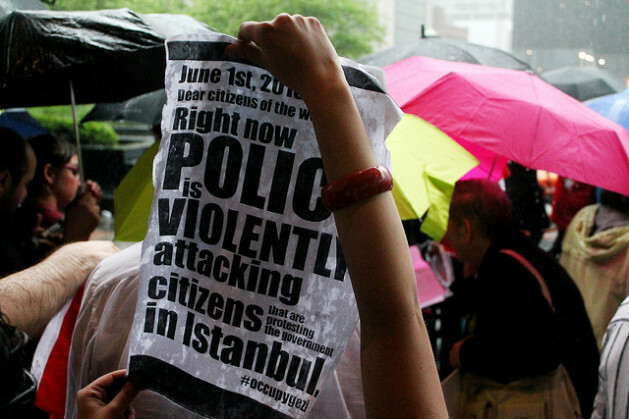 Observers here fear that the deadlock between the prime minister and protesters will only prolong the Taksim movement. Turkey’s political opposition has thus far abstained from adding fuel to the fire through statements or rallies, and in an exclusive interview with IPS, Faruk Logoglu, deputy chairman of the major opposition Republican People’s Party (CHP) and vice-chairman of the Foreign Relations Committee of the Turkish Grand National Assembly (TBMM), rebuffed Erdogan’s accusations that the opposition had instigated the Taksim demonstrations. CHP is the country’s oldest political party, established in 1919 by Turkey’s founder Mustafa Kemal Ataturk, and officially registered in 1923. In the interview (full version available here), Logoglu also outlined the risks for the country should the government continue on its current course vis-à-vis Turkey’s secular middle class. Logoglu believed the current minimum requirement for restoring social peace would be for Erdogan to personally apologise for the acts of the police and his ministers, governors and chiefs of security responsible for managing the conflict on the field. He called on the prime minister to officially commit to changing state policies with respect to human rights, privacy of citizens, and freedom of expression, demonstration and choice of lifestyle. Logoglu, a former career diplomat and ambassador to Washington, also suggested that the current discontent with a large part of the population stems from its frustration with government’s foreign policy.